It’s a little known fact that some Essex-class carriers had a starboard hydraulic catapult which could launch an 8-ton aircraft to 85 mph in 72.5 feet) from which fighters could be launched in the event of an emergency in which the flight deck was completely fouled, or simply to increase launch rate for standard operations. In the above photograph, a Hellcat is launched from USS Hornet (CV-12) in February 1944. CL1 and Tricky Dicky like this. Coca-Cola made a drink just for Soviet leaders! The youngest U.S. serviceman, Calvin Graham, lied about his age to get into the service. He was later found out to be 12 years old. Graham, who died in 1992 at the age of 62, reached the rank of seaman first class in the Navy and a corporal in the USMC. The U.S. Army set up Coca-Cola bottling facilities overseas to keep the troops happy. In this photo from 1944, soldiers who had been on the front line for four months down bottles of Coca-Cola in Italy. Although this is not WW2 business, American astronauts had soda pop in space! Astronauts served Coca-Cola from this device on the Space Shuttle in 1995. Yes, that's a bit of extravagance, but that's what we Yanks are good at. War is such dreadful business and all, so why not make it a bit more civilized eh? Sort of reminds me about some of the Lend-Lease stuff we sent and y'all modified before putting into use like taking the ash trays out of the cockpits of bombers, and taking the ice cream machines out of ships we built for y'all to name a few. B17G .....first flight 16 August 1943 of what would be the final variant and replaced the B17E for the remainder of the war.....max bomb load was improved to 12800 lbs, a far different specification from the earlier version of 2500 lbs payload..supplied the RAF as the Fortress 111 with No 100 Group's No 214 Squadron operating it from February 1943 for the ECM role. As regards obtaining aircraft at a critical time for Britain when the country was in danger of invasion and defeat,the British Purchasing Commission sought to gain sales from the US of all available aircraft with the priority on the numbers available.....tried and tested assessments would come later.US aircraft manufacturing companies who had supply contracts with the French Third Republic cancelled on the fall of France found a ready buyer in the BPC who purchased any aircraft on offer from these cancelled contracts. The BPC started their procurement of US aircraft in earnest in August 1940 when the B17C was already on the production line,being ahead of the B17D. I would think that the BPC seized the opportunity to buy the aircraft while Boeing and the US government were happy for the British to have an early version of the B17 which they may have had reservations about and being aware that they had the improved B17D project,later by 6 months to follow on. Interesting to note in the document that the Tizzard mission of September 1940 conveyed British radar intelligence to the US government,one of the principal secrets was the magnetron which enable the British to develop the H2S bombing radar and ASV for Coastal Commands anti U Boat role.From British radar secrets the US were able to deliver their own bomber radar version,H2X. TriciaF, Seroster, Dave55 and 1 other person like this. Came across an interesting war production engineering manpower comparison. Production of the German MG 42 required 150 manhours while the British Bren required 50 manhours....an interesting fact related to war economy output. Seroster, dbf, CL1 and 1 other person like this. Canada housed more than 35,000 prisoners of war in 27 prison camps during WW2. In 1945, more than 6,000 of them requested permission to stay where they were rather than be returned to Europe. dbf and CL1 like this. During WWII, Canada gave out ‘Applicant for Enlistment’ badges to people who tried to enlist but were refused due to medical reasons, to show their willingness to fight. stolpi, 17thDYRCH, Tricky Dicky and 1 other person like this. The John Inglis plant in Toronto began tooling its facilities for production in 1938. Eventually, producing 186,000 weapons. By 1943, Inglis was producing 60% of the global output of Bren guns. The Inglis facility was expanded to cover 23 acres with 1 million square feet of floor space. Dave55, Harry Ree, SDP and 1 other person like this. In 1945, more than 6,000 of them requested permission to stay where they were rather than be returned to Europe. Well, did they allow any of them to stay? Very few. Some had married Canadian girls and received special dispensation but not a large number. I think it required the direct intervention by an influential Canadian to even secure an appeal. The Geneva Convention obligated the Canadian government to repatriate them. Anecdotally, I have met dozens of former German POW's who arrived in Germany after the war, very disillusioned and finding nothing but ruins. They found their way back to Canada as soon as they could arrange it. Our family pharmacist was a former Luftwaffe pilot and I knew a U-Boat officer who built a successful real estate brokerage. Many came back to settle in the same areas where they had been imprisoned. Northern Ontario seemed to be attractive to them. Dave55, Tricky Dicky and A-58 like this. I've read the 450,000 or so Axis (mostly German) POWs kept in the US were all repatriated, and many of whom wanted to stay for the same reasons you stated. Additionally, many had no homes to go back to that were located in the territories lost in the east to Poland and Russia. And like what you mentioned, many returned to the US as soon as they could. There was one POW who returned here to Baton Rouge and opened up a successful Bed & Breakfast in downtown. While looking into info about POWs here in the US, I came across this. One German POW Georg Gaertner, an Afrika Korps veteran escaped during the war and remained at large for for 40 years until caught by the FBI. 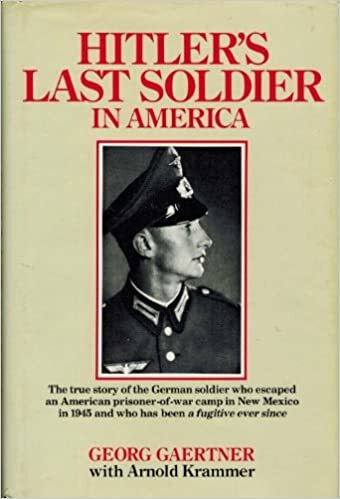 Well after further reading, it turns out that he escaped sometime in late September 1945 after the war had ended, so the FBI did not go hunting for Gartner at all, and when he turned himself in, they had no interest in him at all either. Still, it would make for a good movie, better than most of the crap Hollyweird has been turning out lately anyway IMHO. Carry on. Owen, canuck, Tricky Dicky and 2 others like this. The reason you see most Lancasters or any other IC engined (Bombers) with the bomb bay doors open in photography while at standby in dispersal. Was to ventilate the petrol fumes from the fuselage, and prevent explosions. Having read Robert Kershaw's 'A Street in Arnhem' made me realise what suffering the civilians went through at the time. It was also an excellent book from the point of view of the British and German troops. Not named after what they look like, named for the seats - 'Kubelsitz' - 'Bucket seats' - 'Kubelsitzwagen'. Civvy cars, large & small, adapted by having the doors removed led to an issue of people falling out, so bucket seats introduced to stop this with a bit of lateral support. Seems the term lives on in German to mean ratty cars, but that's the origin. Charley Fortnum, John Melling, A-58 and 4 others like this. For the past 5 years... after creating my own research website for my local two villages memorial to WW1 and WW2. I've learnt in general to keep on researching, follow the drums of war! For they lead you down a long long journey.. sometimes a personal one ! Paul Bradford, CL1 and Dave55 like this. Just reading that the original painting of "Washington crossing the Delaware" was destroyed in by Allied bombing in 1942.
canuck, Dave55, A-58 and 1 other person like this. I just happened to look to see how much a copy of Flying to Victory (about Raymond Collishaw and the early air force vs Italy in North Africa) would cost me and found a negative but extremely well informed review which suggested the author overstated his case a very great deal. e.g. the RA (Italian air force) spotted Western Desert Force and carried out some ground attacks prior to December 9 1940!? Air losses in the first week were fairly even and then the RA started losing air bases. I really feel like someone needs to write a more in depth book about Operation Compass, covering not just the army but the air force and navy in more detail. The British shrapnel mine always seemed a bit wasteful as the actual mine sat inside a rather heavy 'pot' from which it was projected. I had sort of assumed that the German S-Mine launched its whole self into the air when triggered. Checking tonight, I see that both versions of the S-Mine incorporated an outer pot, though they were much more lightly constructed than the British equivalent. I've recently learned that beginning on March 31, 1943 on the US home front, rationing of meat, fats and cheese began, limiting consumers to store purchases of an average of two pounds a week for beef, port, lamb and mutton using a coupon system. According to an Associated Press article at the time, "From the customer viewpoint, the un-rationed oasis of food will be the restaurant or other public eating place." I always thought that meat rationing began much earlier, like soon after Pearl Harbor. From what I read about rationing in the US, the first item to hit the list was automobiles. No new vehicle could be sold beginning January 1, 1942. This caught car dealerships off guard. Over half a million new cars were stuck on the lots as a result. Not sure what happened to them. Maybe the military seized them, who knows.